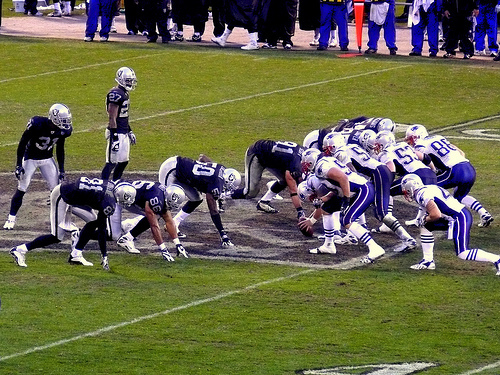 The most popular and profitable sport in the world is U.S. NFL Football (sorry European football fans). However, just because you own a franchise in the most popular sport does not mean that you are generating as much money as you might hope to. There’s always a possibility that not enough people are showing up at your stadium on game day to watch your (possibly losing) team play. What’s a football team owner to do? The 33 owners of the U.S. football teams that make up the National Football League (NFL) have a problem on their hands. Their fans have built themselves an almost perfect viewing setup at home. With the arrival of high-definition televisions (HDTV), high-speed internet connections, and free food and drink, there is very little motivation for a rabid football fan to pay another US$40 to attend a live football game. Another problem with attending a live football game is that it will be hard for the football fan to keep up with their fantasy football team. Fantasy football is where football players from different teams are “drafted” by players to build unique teams which then compete against other fantasy teams based on how the actual players perform in the real world on a weekly basis. All of this fantasy team tracking requires a lot of Internet based data collection and the weak or non-existent WiFi signals at most stadiums makes this impossible to do in real time. The NFL team product managers have a challenge to solve. They do have a popular product – football games. However, they need fans to show up for the games in order for the fans who are not there to see how popular the teams are. The more comfortable the fans become staying at home and watching the games, the less likely they will be to pay additional money to attend the live events. In order to get fans to pay additional money and show up on game day at the stadium where the football game is being played, NFL team product managers have gone back to their product development definition and decided to copy what the fans already have. They have started to build very fancy lounges within the stadium that will provide the fans with what they have at home. This includes TV screens that show not only the game that is being played at the stadium where the fan is, but also all of the other games that are currently being played in the NFL on that day. The product managers have also gone ahead and boosted the strength of the WiFi signal that is available to the fans who are in these lounges. Built in tablets are provided for fans who want to use them. All of this makes it easy for fans to track the progress of their fantasy football teams while the real world games are unfolding. So far, these all seem like things that the NFL product managers can add to their product manager resume. This is a good start, but the NFL product managers have more to do. They need to make the stadium lounges more desirable than the living rooms of their fans. This may have to do with building a sense of community among the people who are in the lounge as well as providing food and drink items that fans can’t get at home. In the end, the product managers need to make it worth $40 to come to a stadium and not watch the live game, but rather to be with friends and watch all of the games on a bank of TV screens. In the U.S. the NFL professional football league has run into a problem: they have gotten too good at providing their football fans with a great living room experience. High-definition televisions and high-speed internet connections have made watching a football game from home almost more enjoyable than buying a ticket and going to the stadium to see the game. NFL product managers are scrambling to find ways to get customers to keep coming to the live games. One way that they are doing this is by creating indoor lounges where customers can sit and watch all of the various games on a bank of TVs. In this lounge they have access to high-speed internet service and both food and drinks are available. This way customers can watch the games and track the status of the fantasy league players and teams at the same time. None of this was in the NFL product manager’s product manager job description, but it has become a critical part of their job. Question For You: What could NFL product managers do to enhance the sense of community people feel while at the stadium on game day?